Peaceable Kingdom Essentials carries natural and organic pet products, but they also think of the humans. Their Herbal Loose Leaf Teas for People are calming with the thought of when you calm the human the pet will follow and ease stress. They have a huge selection of teas, certified organic, and to help with your needs. I received a sample of Iron Clad Tea. Iron Clad Tea helps boost your immune system and helps knock down colds, flu, and bronchitis. 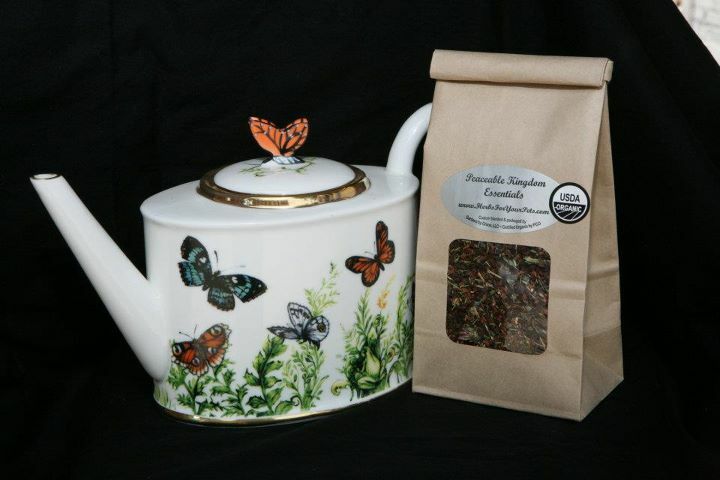 With their special blend of highest quality white peony tea, goldenseal root and spearmint. White Peony Tea contains 20 times the amount of antioxidants of green tea; goldenseal root, a Native American medicine staple serves as a broad-spectrum antibiotic, antiseptic, antiparasitic, antiviral and an all-around defensive agent. The spearmint helps soothe membrane inflammation and adds a delicious flavor.